Having the correct noseweight is vital to towing stability. Too light, and the outfit becomes unstable because the caravan will tend to lift the rear of the towcar; too heavy and the load on the towball will cause the front of the vehicle to lift so affecting the steering. This can obviously lead to instability and serious accidents and here at Caravan Guard we’ve dealt with many caravan insurance claims as a result of poor stability caused by incorrect loading over the years. The correct noseweight for the caravan is the lowest of three noseweight figures: that of the caravan chassis manufacturer; that of the tow vehicle manufacturer; and that of the towbar manufacturer. The chassis manufacturer stamps both the maximum noseweight and the maximum load that the coupling is designed to carry on the coupling. These figures are identified by the letters ‘S’ and ‘GA’ respectively. The towcar’s maximum noseweight will be found in the owner’s manual, whilst the maximum noseweight on the towbar will be found on the towbar plate. Whichever is the lowest is the one you have to work to. In some instances – in the case of older caravans for example – there might be no indication of what the noseweight should be. In such circumstances you should work on the basis of it being between five and seven per cent of the caravan’s MTPLM (Maximum Technically Permissable Laden Mass). For example: a caravan MTPLM of 1400kg, the noseweight would be 70kg at five per cent or 98kg at seven per cent. This shows a wide variation from which it is clear that the noseweight for an individual caravan can vary considerably. In these situations, you should work to the lowest figure from the three sources mentioned above, providing it falls within these two limits. One word of warning: none of the scales mentioned are subject to the Weights and Measures Act and so they should only be regarded as a guide. To check the noseweight using a pair of bathroom scales you’ll also need a short length of broom stick around 15in (38cm) long and a piece of wood which is placed on the scales to spread the load (and not damage your scales). Load the caravan to its MTPLM in the usual way; park it on a flat firm, level surface – concrete or tarmac, not grass – with the steadies raised and wheels chocked. Wind the jockey wheel down to raise the hitch and place the scales in position under it. 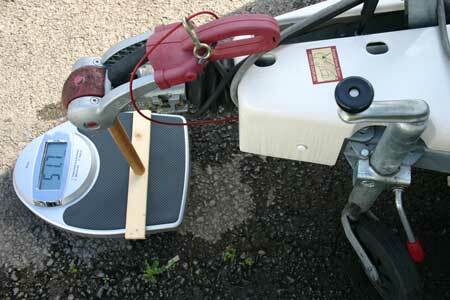 Fit the broom handle into the hitch head and down onto the wood on the scales. Wind the jockey wheel up until the weight of the hitch is fully on the scales and read off the noseweight. The procedure when using a proprietary noseweight gauge is basically the same. In the case of an electronic gauge, this is fitted onto the towball on the tow car and the caravan is then hitched to it. The noseweight is displayed on the screen. Al-Ko offer jockey wheels as an optional extra incorporating noseweight indicator. These allow you to check the noseweight every time you load the caravan. After the first correct check, you might use a permanent marker to mark the position on the gauge. Within the limits set by the chassis, towcar and towbar manufacturers, the heavier the noseweight the better, but if it exceeds the lower of their figures, then you need to adjust the loading of the caravan. Move heavy objects slightly to the rear of the axle line – but not more than about two feet (60cm). If that doesn’t bring the noseweight within the limits then there are two alternatives: move some of the load into the tow vehicle; or leave them behind. Do be careful not to overload your caravan – for more information on loading watch our video and read our article on how to correctly load your caravan. Not sure what bikes you have that weigh 80kg but my one is 14kg and I suspect most are around that figure. But you will lose some weight trying to push that thing along! This is old news but worth a reminder. The bike carriers which sit on the tow bar are also included in nose weight calculations by the police. As a bike can easily weigh 80kg or more – you are prob exceeding your limits before hitching the caravan. There were many people caught out be this some years ago and its best to put bikes on a roof rack. The video states that the caravan should be on level ground, but one of the problems with measuring noseweight is the attitude of the caravan when taking the measurement and the attitude of the caravan when hitched to the car. I check my caravan’s noseweight using a noseweight measuring jockey wheel, and the noseweight varies when the caravan is in the road outside my house as the road slopes. The different noseweights due to the attitude of the caravan are dependant on the triangle of mass above the wheel. When the caravan is pointing downhill there will be more mass towards the front of the caravan, with the opposite effect facing uphill. Also when hitched up, it is recommended that the caravan be slightly nose down, allegedly to partially counteract the wind pressure on the front of the caravan which will tend to rotate the caravan about the wheels, thereby reducing noseweight proportionately when travelling at increasing speeds. Using my jockey wheel measure I can mimic the attitude of the caravan on my (level) drive as though it were hitched up. This may not be possible when using a telescopic measure, nor when using a stick and bathroom scales, depending on the length of the stick, but at least with the stick you could alter its length to achieve a more accurate measurement. p.s. You can be fined up to £2,500, be banned from driving and get 3 penalty points for using a vehicle in a “dangerous condition” which includes overweight or poorly distributed weights. All good info but can I also add a comment regarding moving items into your car. Do also remember that you have a Gross Train Weight, ie “The gross train weight is the weight of the fully-loaded car plus fully-loaded trailer and must not be exceeded” and so if you have too much weight in the car, you need to leave something. Also, adding a roof-box also adds to the problem so don’t forget to include that in your weights too! Over the years i have towed various outfits with different cars and 4X4’s, Nose weights have altered. There will never be a substitute for big car small van for stability and control. I also learned to trim vans long before it was regularly discussed. 1980 Big volvo estate twin axle acceptable but nose sensitive to trimming nw. 90kg. same van 4×4 short wheel base twitchy and prone to drift when passing or being passed by waggons nw. 125kg. I have never towed with any stability aids so cannot say if they could mask a badly trimmed outfit. Currently i have an Eccles Moonstone bought 1999 The nose weight with 2x6kg cylinders and spare locker mounted unladen is 135kg, which i varied depending on car used to tow it. 960 Volvo 90kg. Daihatsu fourtrak 120kg. Currently it’s playmate is a Vauxhall Signum which likes 65kg. Non showed any instability in still air when passing waggons or on windy Autoroutes at speed. I have on occasions dropped speed off when appropriate. Balancing and trimming comes with feeling, to think My car is this ,My van is that therefore my nose weight is. Will give people a false sense of security thinking 60mph here i come. Each outfit differs these are general guidelines, learn to trim for best effect sometimes a little effort pays great dividends. What ever you do be safe if it feels wrong it probably is Always slow as gently as you can never be aggressive Caravans do bite back. Moving heavy items about in your caravan is NOT the way to adjust your nose weight, this makes the caravan more unsafe as it modifies the “moments of inertia”. It is better to consider buying a car and caravan as a pair. This is an important subject which I’m sure many caravanners live in ignorance. My Elddis 530 comes in at 70Kg with nothing in the front despite a 100Kg limit. Add your gas bottles (lites are essential) plus a bit of kit and you are straight on the 100kg. Hey and who travels from the last site with an empty hot water tank? Who is aware of their tow bar limit? I’ve had to change my Suzuki Grand Vitara which is a brilliant tow car as it only has a 85KG limit. My replacement Freelander 2 is one of the few smaller towcars with 150 Kg available. This is a subject that really has to be brought up frequently as manufacturers are not doing anything about it. Have you tried the tips in the article Scott? I have just purchase a compass omega 550 caravan 2014, the car tow ball weight is just 70kg this is on a peuqeot 3008 2 lite 168 bhp 2013 ,in the front locker is the gas bottle the lite version but I can not get the nose weight down .can not load the car up as this makes the back of the car go down and the front come up this car is a front wheel drive ,and the van has back island bed in the middle. Hi Laura,I have a Citroen C4 Picasso 2.0 petrol MPV, My nose weight is 60kg and like you I am worried about the low nose weight. The local dealer did not know anything about the weights etc,so I phoned Citroen UK about my concerns. The gentleman at Citroen says I can pull a 1500kg caravan at 60kg nose weight: 4% 1500 = 60kg nose weight. He said that Citroen have done exhaustive tests with nose weights. I can only go with what he has told me. I am lucky I have a 1998 ABI Dalesman 420/2 which is 1050kg towing weight but the nose weight is 75kg,so I can trim my nose weight to 60kg. Hope this helps, hope you get it sorted. don’t think it applies just to caravans.I have a pod teardrop was told a motor bike and side car could pull 300kg.I have a kia picante can pull it but the nose weight is over the 28kg allowed it is getting silly and I wasted all that money.The morris minor I had did the job! Basically I went last week and told them the car they have sold me only tows 1180kg when I need 1185kg, the kerb weight is fine within the 85% yet the Gross Train Weight is only 1130KG which and the vans weight to my cars gross weight of 2250 is well over the train weight. Apparently they never heard of this before, to which I said well its a legal requirement. There response was that id never fully load the car, but what if I wanted to. I also mentioned that the nose weight was not achievable or realistic with a 50kg limit. I think they were a little taken back that a female knows her towing stuff lol and so have said they will have to go back to citeron to check which is fine they can do that but I am only quoting what there hand book says so I dont know how this would change anything. That’s a real pity Laura, seems strange that such a big car manufacturer isn’t fully up to speed with towing regulation. Hopefully the new car is still under warranty and you’ll be able to get out touring before the end of the summer! Just purchased a new Sprite Alpine 4. Tested the nose weight using a indicator before first outing. It was 100 kg. after moving all items from front locker and putting as much equipment as able under the bed behind the axle – was only able to archive 90kg. My tow bar is rated at 70 kg. This makes me very angry – because it seems caravan manufactures have learnt nothing about design as all the weight in the caravan – like fridges and batteries are foward of the axle. They are selling caravans that cannot be towed by many UK cars with out breaking the law. Hi I am new to towing a van I have a 1999 Swift Challenger 500 SE 4 berth where can I get the nose weight figure from equally for the car. The chassis manufacturer stamps both the maximum noseweight and the maximum load that the coupling is designed to carry on the coupling. These figures are identified by the letters ‘S’ and ‘GA’ respectively. The towcar’s maximum noseweight will be found in the owner’s manual, whilst the maximum noseweight on the towbar will be found on the towbar plate. The lowest of these three figures is the correct noseweight. If there’s no indication of any of these on your Swift Challenger as it’s slightly older model, you should work on the basis of it being between 5 and 7 per cent of the caravan’s Maximum Technically Permissable Laden Mass, known as MTPLM. For example: caravan MTPLM of 1400kg, the noseweight would be 70kg at 5 per cent or 98kg at 7 per cent. You should be able to find the MTPLM is your handbook. I have an Avondale 380/2,with motor movers on,making the front too heavy,I find placing most kit over and behind the axle works,also including the jockey wheel. I recently purchased a new Lunar caravan. 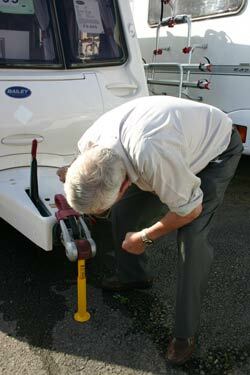 Being a very experienced caravaner and very careful at all aspects of towing I have checked the noseweight several times. It should have been a max of 75kg but after several checks I cannot get it lower than 95kg. The measurement was taken with just one gas bottle in the front locker and nothing else so I am very frustrated as to why this should be so.I have contacted Lunar with this problem but after nearly a year they have not even bothered to acknowledge my query. The towball weight of my vehicle is 100kg. What should I do as I am obviously loathe to put heavy items such as an awning well behind the axle. Does this mean that caravans leave the factory with an illegal noseweight in the first place? I spoke to caravanning expert and journalist, Doug King, about this one. If you’re having problems with the noseweight on a new caravan, it’s probably best to discuss it with your dealer. They should be able to resolve any problems. Getting rid of on board water is a great idea to reduce the noseweight kevin. That’s a great tip Kev! Easy to do and helps save on fuel too. I have an Elddis Affinity 574, quoted (and measured) noseweight 100Kg, which is O.K. with my current car (Ford Kuga, N.W. 105Kg). However, I am looking for a car with more luggage space (for 2 Labrador dogs). The Caravan Club have just voted the Skoda Superbe Estate as Towcar of the Year. It has masses of space – BUT – max noseweight 80Kg. Much internet searching shows very few cars can cope with 100Kg noseweight – yet caravan manufacturers hardly mention noseweight in their bumf. It’s my bet that there are an awful lot of folks out there towing mis-matched noseweight outfits. How can the CC name any car with a puny 80Kg max “Towcar of the Year”? I have to apply an upward pressure of about 20kg to fit the bar of my (old fashioned) stabiliser into the plastic retainer. So if I measure the noseweight at (say) 80kg before hitching up, the actual download at the towball will be higher than 80kg. Even allowing for the distance of the retainer behind the towball, I’ll be towing at a higher noseweight than intended. Hi Barry, I’ve passed your query on to Journalist Doug King who wrote the article, he should have some suggestions for you. I’ll let you know his response. There is no need to worry about the effect of your blade type stabiliser on the noseweight. 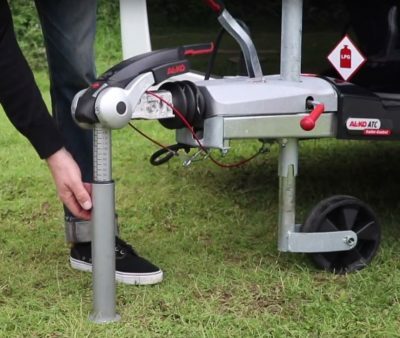 Thousands of caravanners have used them over the years and the one thing they haven’t had to consider is the pressure exerted on the rear of the towcar. If you were to be stopped in a roadside police check the stabiliser would be disconnected before the noseweight was checked as stabilisers are not required by law; they are an ancillary piece of equipment fitted at the owner’s discretion. I hope this answers your question, let me know if you need anything else. Dave, what have you done to reduced the noseweight? Most caravan manufacturers only have a noseweight of 100kg.. So how are you getting 140kg… What have you got that weighs so much in front of the axle? If I’m understanding you right, what you’re saying is to raise the height of the caravan hitch, by winding down the jockey wheel, so that it is at the height it would normally sit on the cars towball. Then put the scales or noseweight gauge in place and wind the jockey wheel off the ground, in order to get a more accurate reading. According to the CC. When checking the noseweight of your van, your supposed to raise the jockey wheel to the height of the tow bar on your can. Then place the noseweight gauge on the hitch, If need be chocks of wood are to be used so that the gauge sits normally, then the jockey wheel raised. Gives a more accurate reading…..
With reference to James Finnigan and struggling to reduce his caravan noseweight, may I suggest if you haven’t already done it to exchange the 2 steel gas cylinders in the front locker for the lighter version as these are about half the weight of the standard steel type. This is what I had to do to reduce the noseweight on my caravan and the only items I now carry in the front locker whilst in transit are the 2 lightweight propane gas cylinders, a pair of lightweight levelling ramps and a plastic fire bucket. When set up on site you can then utilise the front locker as an extra storage compartment and transfer other items from the interior to the front locker. James – My first thought would perhaps be to speak to the company who fitted the motor mover and ask if there is anything that can be done. Otherwise your only option really is to ensure as much weight as possible is counterbalanced towards the back of the van. Peter – As long as the noseweight is within the recommended limits then shouldn’t be an issue with it being a Twin Axle. As you say they do carry weight better but also weigh more themselves making the 85% loading rule more of an issue than noseweight. I know Milenco extremely well and hold their products in the highest esteem. However, I have never checked their noseweight gauge and whilst I am prepared to accept their claims as to its accuracy, I would not be prepared to vouch for it without having checked it. I should also point out that all noseweights can have a wide variation in interpretation. The Caravan Club says that the noseweight can be between 5-7 per cent of its MTPLM. Hence for a caravan with an MTPLM of 1500kg it could vary between 75kg and 105kg! The figure the police would work to is the lowest of that stated by the tow vehicle manufacturer, the caravan manufacturer and the chassis and hitch manufacturer. So in reality although bathroom scales and other proprietary noseweight gauges are not covered by the Weights and Measures Act, any one of them could be used to get an approximate reading. I have a Sterling Bessacarr 625 fitted with tandem motor movers and I found that as the four motor movers were fitted one to each wheel, it all equalled its self out and did not alter the tow bar weight at all. Our caravan has been fitted with an electric mover which means we have added a lot of weight in front of the axle and this has made it very difficult to get the nose weight down to within the correct limits even after shiffting all the heavy stuff to the back, any suggestions. The caravan noseweight information here is an interesting article but according to Milenco there is only one noseweight gauge on the market that conforms to BS7961 and that is their own brand. Surely if this is true then all caravan insurance companies should acknowledge the fact that due to it’s continuous accuracy this should be the only noseweight gauge recognised as being the tool actually fit for purpose. 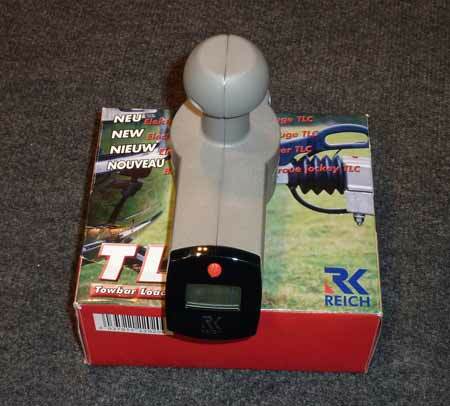 There are several different types on the market all trying to achieve the same goal by making a safer balanced outfit between towcar and trailer but if they are only a basic guide and do not conform to any kind of standard then there is the possibility that people who buy them are being misled into believing they have the right tool for the job when in fact this is quite false. All measuring instruments have a tolerance band which have to be adhered to but if the specific tolerance is a too wider range then it is basically unfit for purpose due to it’s innacuaracy. Due to this fact I consider it paramount that all manufacturers of noseweight gauges should conform to this British Standard in the future so that people using them can be sure of their reliabilty and accuracy for the sake of road safety in general for everyone. How does this work for twin axle caravans which tend to be balanced by virtue of the 4 wheels being in the middle. 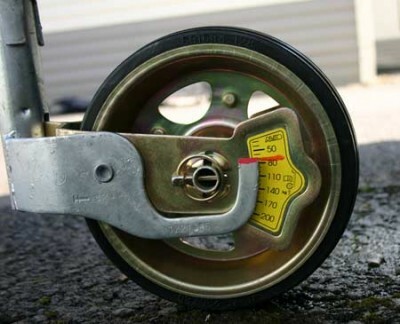 There is no nosedive if the jockey wheel is fully raised – the caravan remains horizontally stable.